So this is my idea of Christmas decorating: clear off two shelves and stick all the Christmas stuff on them. Done. I have never bought many Christmas decorations besides ornaments. 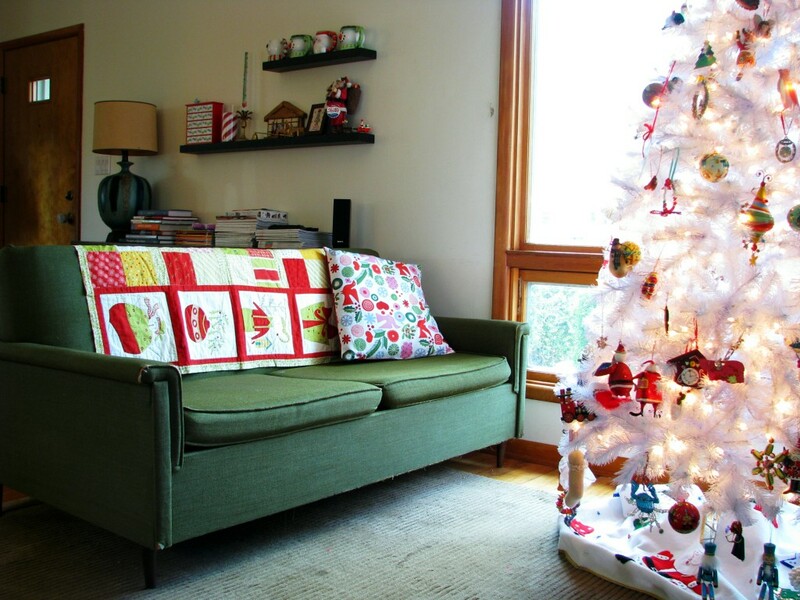 The only things in this photo that were chosen by me are the fabric for the pillow cover I made, the tree, and that candy cane candle up on the shelf. The rest were gifts or hand-me downs. They are all fun things, and somehow they sorta all go together. Kind of. Sometimes I get the urge to go all color-coordinated and modern with the decorations, but I know my kids have already developed sentimental attachments to the things we have. And so have I. Maybe I’ll add in some more things once we’ve gotten past the point where every decoration is a toy. I hate to invest my time in something that will just be destroyed (you can also apply this phrase to everything in my house). Actually, half of this stuff is probably going to be broken in ten years’ time anyway! My children will inherit a pile of sentiment-laden, glued-together holiday decor — just as it should be. The one new thing I may add this year is a pretty centerpiece for a family dinner. Something shiny. Something not breakable. Metal maybe? Brass. That sounds sturdy.